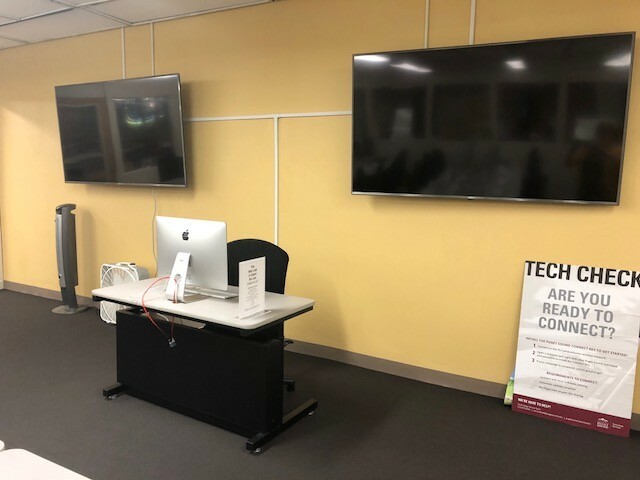 The Tech Center is available for student use during general access hours, and is also used as a teaching lab by Educational Technology. We offer trainings in this space for special digital projects and course-related technology use. The Tech Center has multiple areas for group and individual video viewing, editing, and collaboration spaces. We also have two microrecording studios for audio projects. 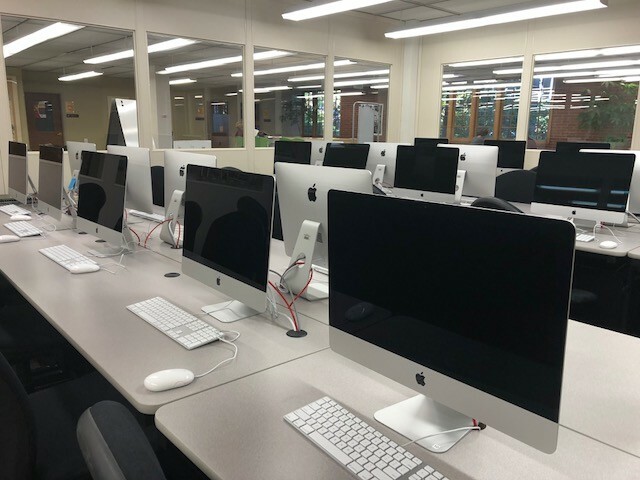 Our Mac Lab on the 1st floor of Collins Library in the Learning Commons offers students a space on campus where they can access various specialty software to help them create, connect, and collaborate on personal and academic projects. The lab has 28 iMacs with Adobe Creative Suite and other specialized software. Media items such as video cameras are available for checkout at the Technology Service Desk on the lower level of Collins Library. Friday: 7:30 a.m. - 9 p.m.
Microsoft Suite: Students can access the complete Microsoft Suite, including Microsoft Word, Microsoft Excel, and Microsoft PowerPoint to complete assignments and projects for class. Adobe Creative Suite: Adobe CC gives you access to a collection of Adobe applications for Graphic Design, Video Editing, Web Development, Photography, and Cloud Services. iWork Applications: Access productivity software from Apple, including Pages to edit creative and professional documents, Numbers to interact with and edit data, and Keynote to create visually appealing slideshows. iMovie and Finale Cut Pro: Create and edit video content using Apple's easy-to-learn applications. iMovie offers a user-friendly option for students to create professional videos edit them, while Finale Cut Pro allows students to create more professional-quality projects as Finale provides access to a wide variety of effects and titling options to allow more creativity in video projects. Garageband and Audacity: Use Garageband to access a complete sound library and learn, play, record, and share music and podcasts. Audacity is also an audio editor and recorder commonly used for podcasts, where users can record live audio and cut, copy, splice or mix sounds together. Tableau: Tableau is an interactive data visualization tool that can be used to create with customized visual analytics (dashboards) and generate compelling insights using a wide variety of data sources. Friday: 8:00 a.m. -5:00 p.m.
Saturday - Sunday: Noon - 4:00 p.m.
Checkout for all equipment loans varies by type, but all items are available for renewal by phone, email, or a visit to the Media Services desk.